I began working with stick-and-poke tattoo in 2013, around the same time I started doing embroidery. The similarity of gesture in these two processes sparked an ongoing project: tattooing scribbled gestural marks that resemble my drawings and embroideries. Since then, tattoos have formed a significant aspect of my practice, both within gallery-based works and as standalone commissions. They are often an extension of the themes and images I'm exploring in the studio. Needlepoint Club Conversations, 2016, was shown in UNGLAMOROUS, a group exhibition curated by Elizabeth Pedlar at Moana Project Space, Perth. 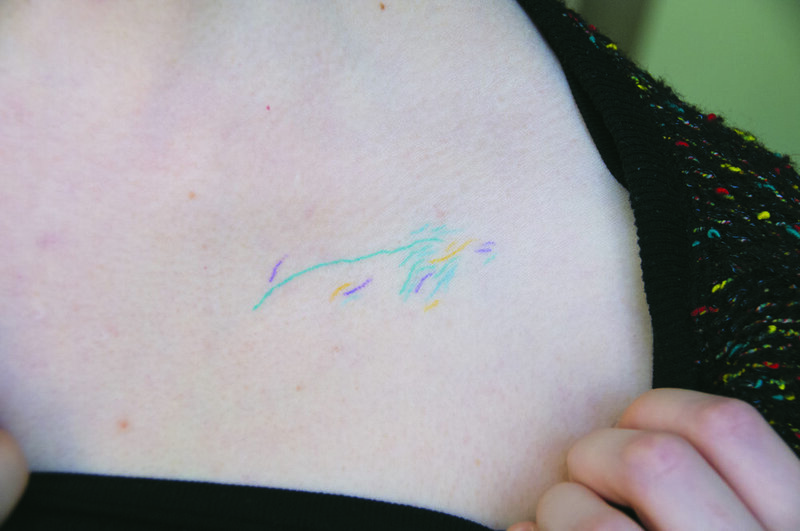 Alongside photographs of several abstract tattoos, I produced audio interviews with four recipients (archived online). Rock collection (and dispersion and dissolution) formed part of my project Lead Me To The Holy Mountain (Garden Shed Gallery, Melbourne). Over two days I tattooed stippled drawings of rocks onto twelve people. In 2018 I began tattooing drawings of vessels, which reflect the objects and embroideries I'm making in the studio. Rock collection (and dispersion and dissolution), 2016. Day 1. Rock collection (and dispersion and dissolution), 2016. Day 2.